Sauces: Traditional Red Sauce, White Garlic Sauce, Pesto Base, BBQ, or Hot Wing sauce. Meats: Pepperoni, Sausage, Meatballs, Bacon, Chicken Cutlet, Grilled Chicken, Salami. BBQ Chicken, Ham. Cheeses: Mozzarella, Cheddar, Feta, Ricotta. Specialty Pies: Please see our Specialty Pies page here. 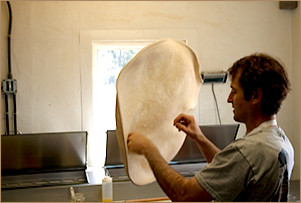 We make our thin crust NYC style pizza here in Vermont, with dough made fresh in-house. We use only the freshest ingredients in our slices and full pizzas. From thin crust NYC style pizza to Thick crust Sicilian-style pies Jimmzpizza.com is Vermont best pizza. Located between Waterbury Vermont and Stowe VT. JimmzPizza is a popular spot with skiers, snowmobilers, mountain bikers, locals and visitors alike. The patio has a great scenic view. Local beers and micro brews are always on tap and ice cold.